It’s an endless tropical passion with the Riomaggiore. This maxi kaftan puts together multifaceted, intricate and colorful patterns, adorned with a beaded deep neckline. Perfect as a beach cover up or paired with pants for an everyday statement piece. 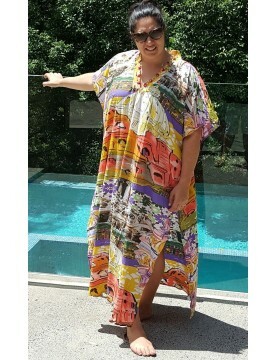 Karma Tunic Swimsuit Cover Up by Magicsuit features stylish oversized Kimono style sleeves and v-neckline flow casually against your silhouette. A drawstring waist provides endless comfort and takes you from pool to poolside in no time. Flirty and fashionable Empire waist Long Sleeve Swimsuit Cover Up by Jantzen.